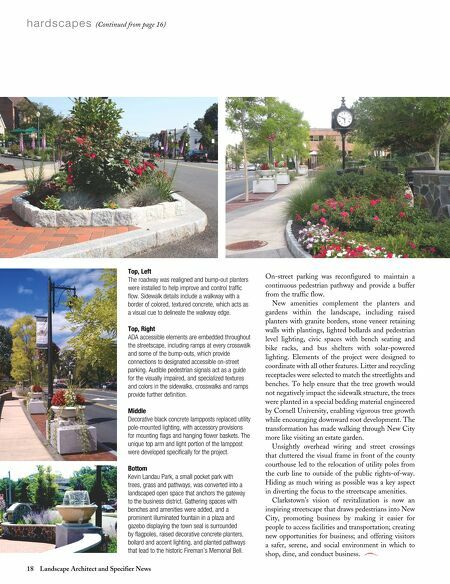 (Continued from page 16) h a rd s c a p e s Top, Left The roadway was realigned and bump-out planters were installed to help improve and control traffic flow. Sidewalk details include a walkway with a border of colored, textured concrete, which acts as a visual cue to delineate the walkway edge. Top, Right ADA accessible elements are embedded throughout the streetscape, including ramps at every crosswalk and some of the bump-outs, which provide connections to designated accessible on-street parking. Audible pedestrian signals act as a guide for the visually impaired, and specialized textures and colors in the sidewalks, crosswalks and ramps provide further definition. Middle Decorative black concrete lampposts replaced utility pole-mounted lighting, with accessory provisions for mounting flags and hanging flower baskets. The unique top arm and light portion of the lamppost were developed specifically for the project. Bottom Kevin Landau Park, a small pocket park with trees, grass and pathways, was converted into a landscaped open space that anchors the gateway to the business district. Gathering spaces with benches and amenities were added, and a prominent illuminated fountain in a plaza and gazebo displaying the town seal is surrounded by flagpoles, raised decorative concrete planters, bollard and accent lighting, and planted pathways that lead to the historic Fireman's Memorial Bell. 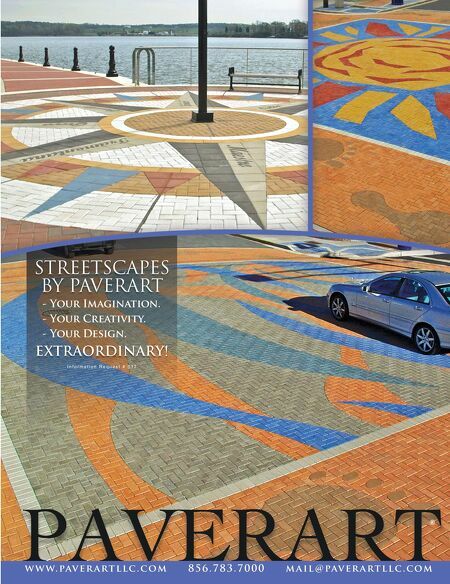 18 Landscape Architect and Specifier News On-street parking was reconfigured to maintain a continuous pedestrian pathway and provide a buffer from the traffic flow. New amenities complement the planters and gardens within the landscape, including raised planters with granite borders, stone veneer retaining walls with plantings, lighted bollards and pedestrian level lighting, civic spaces with bench seating and bike racks, and bus shelters with solar-powered lighting. Elements of the project were designed to coordinate with all other features. Litter and recycling receptacles were selected to match the streetlights and benches. To help ensure that the tree growth would not negatively impact the sidewalk structure, the trees were planted in a special bedding material engineered by Cornell University, enabling vigorous tree growth while encouraging downward root development. The transformation has made walking through New City more like visiting an estate garden. Unsightly overhead wiring and street crossings that cluttered the visual frame in front of the county courthouse led to the relocation of utility poles from the curb line to outside of the public rights-of-way. Hiding as much wiring as possible was a key aspect in diverting the focus to the streetscape amenities. Clarkstown's vision of revitalization is now an inspiring streetscape that draws pedestrians into New City, promoting business by making it easier for people to access facilities and transportation; creating new opportunities for business; and offering visitors a safer, serene, and social environment in which to shop, dine, and conduct business.